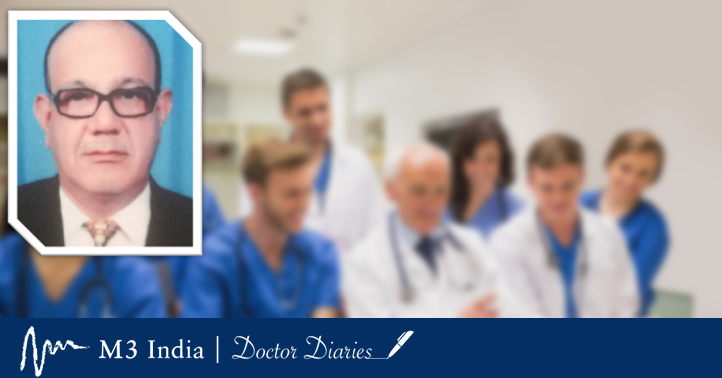 In this week's Doctor Diaries blog, Dr. Ashok Raina recollects his medical school days and pays a heartfelt tribute to one his teachers. Through the journey of almost forty years in this noble profession, I can relate to lots of incidents which speak of strife, tribulation, pride, prejudice agony, and joy. In my opinion it happens to be a part of each and every medico’s life, with the only difference being that of perception and degree of sensitivity varying from individual to individual. I am here with an incident, which changed me to be not only a better doctor but a better human being as well. As a young medico bubbling with extreme high octane energy, a few of my batch mates and I would often be jealous of our teachers who had this air of superiority to them, which was not just restricted to the classroom, but also when they were around patients, who appeared to revere them. This was something unacceptable for our ego. Our unwilling submission to their rule of discipline and training, in spite of certain things being beyond our comprehension led to a kind of 'love-hate' relationship with our teachers even while graduating. And as time moved on, it was somewhere after about twenty-five odd years in my practice, that the harsh reality dawned on me- trying to figure out the real purpose of being a doctor in faraway lands, comprehending medical ethics, and being part of the rat race. The past had faded away into the deep crevices of the subconscious mind and a recollection or remembrance of those good old days was simply out of question. One of my patients who happened to suffer from multiple lifestyle disorders, had been my regular, receiving treatment. Since, he too happened to be from my home town, a very good friendship was created besides the standard doctor-patient relationship. It was on his vacation, that he had to consult a doctor for his health issues and he happened to meet with one of my teachers for a consultation. He was Prof. Dr. G.Q. Allaqaband, who was a famous physician and had retired from GMC Srinagar as Professor & Head of the Department of Internal Medicine and Dean of the medical college. Having had a distinguished career spanning four to five decades as a teacher even through retirement, he continued to serve humanity by running a private practice in Srinagar, Kashmir. When my patient returned from his vacation and met me, he showed me the prescriptions and other documents, and it was there that I recollected the lost memories of my younger days. What surprised me was when my patient mentioned that my teacher had told him to not seek any other opinion but follow up with me and had assured him that he was in safe hands. I was elated at the praise I had received from my teacher and at the same time felt special that a great teacher like him would praise his student. I traveled down memory lane again, but this time, I was overwhelmed by my guilt. I longed to communicate with my teacher but unfortunately, my situation was such that physical meeting was not possible. But as luck would have it, I saw him on social media. And on the first available opportunity, I communicated with my teacher and I wrote seeking his forgiveness. I am reprinting the same letter here..
Once I saw you today on Facebook, I travelled back to the late70’s. I being one of those students, who perhaps in your opinion would achieve nothing in life, was a waste of a medical seat that a probably more deserving candidate missed out on, could finally do justice to the profession. Indeed, my father was the sole person responsible for bringing me to you as a student and you knew it well. I had a love and hate relationship, perhaps not only with you but with all my teachers. I admired how you had cultivated the technique of beautifully articulating medical jargon and weaving it into a lovely short story of about 45 minutes that included information on the complete disease and its management, and nail it straight to our brains. And you would keep us spellbound. I cannot speak for others, but what I used to feel was that you were so aloof from us, you probably thought of us as your enemies. I used to feel that you fear our presence in the profession. All this said and done, I graduated in the year 1979, was involved in ideological clashes with almost all my teachers including my father and after residency was over, I was thrown to one of the most remote parts of the state in Rajouri district, J&K. Despite a common friend Dr. Sharma being the director of health, I lasted only a few months and was back to the college as a demonstrator. But I must admit, I still had not learned the basic philosophy of medicine. I stayed a few months and left my country to go to Iran. It was here that the real test of my credibility began. It was in this land were at every step I was evaluated not only for my medical knowledge but also for my humanity. Not only did I pass the test, but I stood out as a shining star all these years academically and wherever I went, I made it a point through sheer hard work and dedication to prove that you had succeeded in turning me into a successful doctor and that every one acknowledged that GMC Srinagar with its teachers including you, was always considered to be one of the best world over. Today, after almost 35 years, I realise that though everyone subscribes to different ideologies, what I learnt from you all, was love for all, and humanity. Even today, thousands of miles away from my homeland, I am working with poor and helpless human beings numbering about three thousand, Sir, I have not made money nor a name. I do not visit a church, mosque, or temple, but the work which I am doing has given me eternal peace and yes sir, I was elated when one of my patients visited you a couple of years back and you told him that he need not visit you but continue following up with me. Today through this letter, I thank not only you sir but all my teachers, which includes my father as well. Doctor Diaries is M3 India's new blog section where we encourage our doctor members to share stories and anecdotes from their professional lives that may have made a deep personal impact. If you have a story to tell, write down your story and the lessons it left you with and share with us on email at editor@m3india.in. We will give it the audience that it deserves. Read more about Doctor Diaries here.